This bespoke course is designed specifically to meet the needs of busy therapists with an interest in Acupuncture who are currently involved in treating musculoskeletal conditions. The course will address a wide range of conditions, which are seen on a daily basis and will provide theoretical and practical experience in the application of acupuncture. The course is taught by the renowned Bernard Nolan who brings with him a wealth of expertise and authority on the discipline of Acupuncture. After the course you will have 2 months to complete a case study. The requirements of this course will be discussed in detail over the duration of the course. 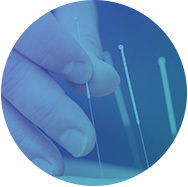 Upon successful completion of the 4-day course and the case study, you will be able to offer Acupuncture as an additional treatment modality to your patients. This course is available to any trained therapist such as Sports Massage Therapist, Osteopath, Physiotherapist and Chiropractor, any of whom must have insurance in place.